Falkland Islanders never struck me as a particularly pleasant bunch of people, and the place itself is as miserable as a wet weekend in, well, Stanley. But it has to be said there is no tenable position for the the Argentinian Republic to claim them. I really like Argentina, and Argentinians, but collectively as a nation they don’t have a terribly good record of peaceful neighbourly relations. They seem just a little insecure, why heaven’s knows, they have no reason to be. 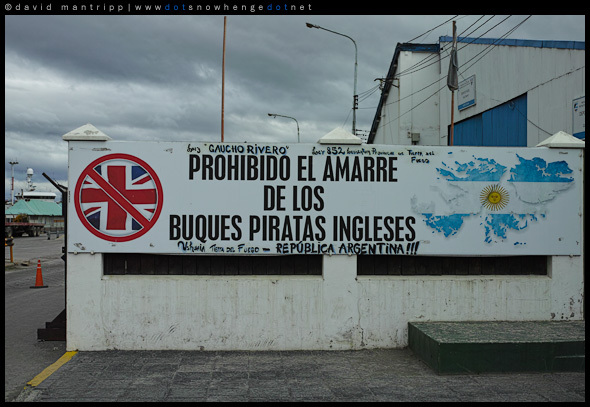 Everywhere you go in Argentina, you can’t get away from being reminded that Las Malvinas son (no they’re not and never were) y seran (unlikely, the way they’re going about it) Argentinas. It gets real, really tiresome and quite frankly detracts from the fantastic natural and cultural riches the country actually does possess. I guess I could, maybe, be convinced of the geographical argument, but even then Chile might also have a valid claim. But when the looney element of the Argentine body politic also lays claim to South Georgia and the South Sandwich islands (not to mention Antarctica) they go way off the red end of the credibility scale. Why not grab Tristan da Cunha while they’re at it? After all that’s Imperialist Colonist British too! Or why not South Africa, it’s on the same latitude as Argentina!! I can’t see how this is ever going to get resolved. It would require adult behaviour on both sides, and of course a British government willing to restrain itself from stirring the pot. Fat chance of any of that. Today in the Independent Johann Hari has a pretty good article on the climate change issue leading up to Copenhagen. There isn’t anything alarmist or sensationalist about it, and most of the examples he gives are not predictions - they’ve already happened. I recommend reading the article. But don’t read the comments. Please don’t read the comments. Not unless you want to feel like you immersed in a nauseating slime that will never wash off. The Independent which normally appeals to a readership which doesn’t drag its knuckles along the ground, but you’d never know it here. The (sadly typical) display of ignorance and denial fueled by petty greed and bigotry is more than enough to make me feel that wiping out the human species, by and large, will be a very positive step for the Universe.